At ERA InfoTech’s office in palton everything from the unassuming decoration to the tidy orderliness signals efficiency. The man that is gently holding the helm of the ship is the CEO Md. Serajul Islam, FCMA. A quick look at his office and a follow up discussion with him would soon reveal that the vibe of efficiency the organization exudes is clearly a reflection of its leader. The whole solution &amp; support activities has been strengthened after joining of Mr Md Serajul Islam, FCMA who was firstly deputed at IT Dept on May 2005 as business analyst for providing banking domain knowledge for the development of IT product and services. 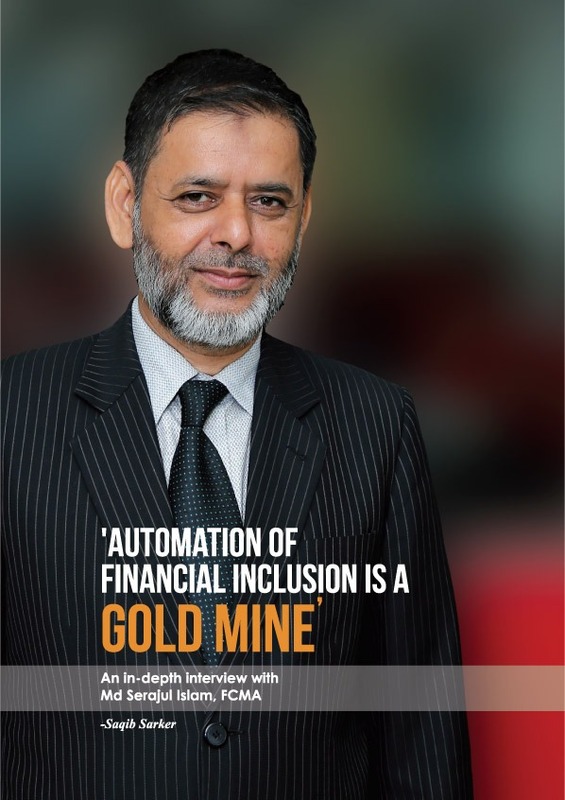 His initiatives to centrally control reduce the operational risk factors of banking business. 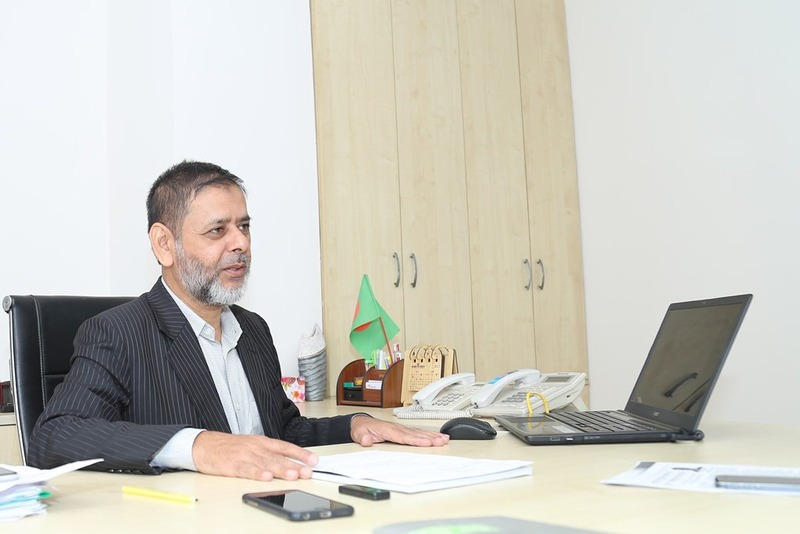 His profound knowledge in banking business helped IT Dept to conduct training for all users of CBS-Stelar which increased the confidence of users on Stelar. In addition to these assignments, he was the coordinator of ERA InfoTech Ltd on behalf of Bank Asia Ltd where he has lead a group of young expert IT professional of 22 members.  Up gradation of Oracle RDBMS to latest version Oracle 10g to avail the latest facilities/advantages of that. Bringing over 16 years of experience in the banking sector Md. Serajul Islam’s leadership has been at the forefront since the company’s inception and continues to be a vital force. 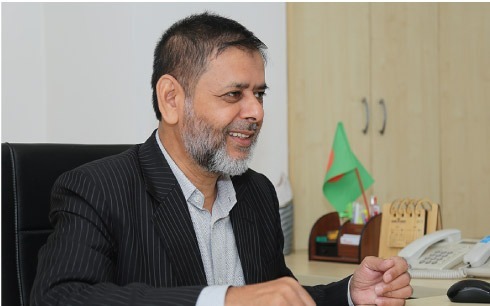 He was selected one of the 100 most respected CEOs of Bangladesh by Ajker Aorthokantha. To know more about the back story of the IT company, its vision, successes and struggles we sat down for an interview with CEO Md. Serajul Islam. We asked questions about the technology, local business, leadership among other things, and learned in detail about the commendable achievements ERA InfoTech has gathered under its belt. When I was there, in 2001, I found out that 90 percent of the Exim Bank loans were defaults and classified. The reason was their inexperience, the main reason in particular was that they diverted the fund. I wouldn’t say those entrepreneurs failed, they diverted the fund (to unauthorized areas) and they were successful in those areas. I was given the responsibility for recovery so, naturally the next step for me was to look into recovery, as most of the borrowers were defaulters. So, I had to visit every site. I would go to those sites with an asset seizure notice and order from court. When I started doing this I saw that many of those people were really respectable persons of the society. They didn’t even imagine that Sonali Bank would send someone like this. As the word spread, those people started come to the bank from shame and fear and started paying. Mainly, a lot of them entered into negotiations. They requested us to not put up the red sign of default on the premise. Anyway, I did my work and that led them to come to the bank and negotiate. As a result, a lot of recovery was possible. The reason I mention all of this stories is to make the point that there is a weakness in strategy in loan monitoring. Since you are a fintech magazine and work in the field of banking I thought you should know this. I did that with the intention to find out how to get a recovery. Ultimately, I was rewarded by Sonali Bank. After working at that division I was transferred to the Treasury & Accounts division. I worked at the treasury for a while, worked in accounts department for a while too. In 2004 I left Sonali Bank and joined Bank Asia in the Accounts department during the tenure I have prepared the Manual of Finance & Account for Bank Asia Limited, this Manual was approved by the board of Directors of Bank Asia Ltd. I told the Managing Director that a lot can be done with the software, but we don’t have business analysts. Business analysts are most essential for developing a software. If you don’t know the business, how will you make the software? Software engineers don’t know banking. So, MD sir told me to start working with the IT and I joined the IT department. After the IT head left I was given the responsibility to lead the IT department, as the head of IT in-charge. As a Management Accountant professional my main expertise was in management. So, I brought some changes according to my understanding. I changed the operating system and some operational procedure, all of these changes made the operation a lot smoother. I did a training course in Japan called ‘Business Innovation by Information Technology’. It was a two-week program. It helped me a lot. It was so useful that I felt that it wasn’t a 15-day training, rather it felt like it was a 15-year training. Later on when an IT head joined I told the higher management that ERA InfoTech could be separated from the bank to form its own company. If we do that then a lot of people would be able to work there, a lot of software engineers. Since we already have a company formed, there is no need to stay under the umbrella of the bank. They agreed and we started operation in 2008 as a separate entity and I was made in-charge. Although it was unofficial at that point, my official designation was deputy IT head of Bank Asia. In 2007 I started the procedure with ISO and ISMS. ISMS is Information Security Management System. So we became the first ever ISMS certified software company in Bangladesh in 2008. Fintech: Bangladeshi companies tend to get the ISO certification more…. MSI: Yes, exactly. ISO is concerned with quality management, it’s needed in even manufacturing, doesn’t matter if you are making biscuits or furniture. But ISMS is about information security. It is essential for a software company. We started looking for work outside Bank Asia and the first work we got was from the Standard Bank, initially for Core Banking Solution. But after the CBS, we developed the full suit for them, everything you need in a banking operation. Kazi Akram sir who was and still is the Chairman of the Standard Bank, and a former president of FBCCI, agreed to take the solution from us, as Bank Asia already used the same solution. That was the start of our journey, the step outside of our door. After that we did Hikmah, which was a Shariah based CBS. We worked closely with Azizul Huq sir in developing Hikmah. 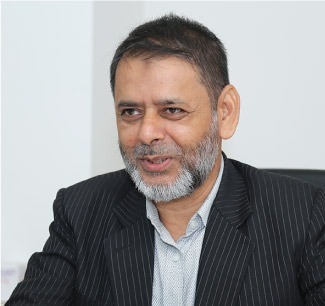 He is the pioneer in islamic banking in Bangladesh, presidential award winning scholar and was one of the founders of Islami Bank Bangladesh. He provided consultancy for two and a half years for developing this solution and it was developed fully under his guidance. The technique or policy we approach with this solution, called ISR or ‘Income Sharing Ratio’ is unique. No other Islamic software has this unique feature. Fintech: Who are suing this? MSI: As of today, three banks are using this: Bank Asia, the Standard Bank and Sonali Bank. 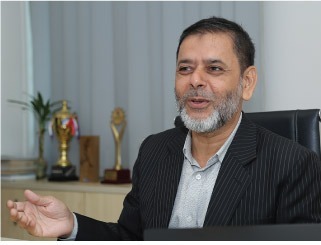 Sonali Bank runs Hikmah in six branches in six divisions and it is centrally run using the solution. After that we developed the BACH & EFT or ‘electronic fund transfer’ software for banks according to Bangladesh Bank requirements. We had faced a lot of difficulties in persuading banks to take our software. It was difficult because banks were reluctant, as we are a local developer. Almost everyone uses foreign software. Only Bank Asia and Sonali Bank took our software, and I have to say Sonali Bank supported us a lot. But many institutions, who bought Indian or foreign software, started to suffer a lot in service and support. After that interest started to grow in our solution. Now 14 banks use our software. Among them we provide complete solution to four banks: Bank Asia Ltd, Standard Bank Ltd, Bangladesh Commerce Bank Ltd & Bangladesh Development Bank Ltd. We provide these four banks with everything they need in software solution. We have now the experience of developing everything needed for banking. There is a perception that Bangladeshi software engineers have lacking or they can’t do highest quality work. I do not accept that at all. From our company a developer went to work in our partner company in Dubai. He first worked there as a software engineer. Now he is the team leader of the development team there. They have a whole host of Indian engineers. If he didn’t have the quality how he became the team leader? Another staff of ours, who was a DBA (database administrator) here, went to USA and became a senior DBA there. Any Bangladeshi software engineer, would dream about that kinds of post in the US. Another girl, who worked in our ‘Ektee Bari Ektee Khamar’ (EBEK) project also now work as a DBA in the Australia. Some of our former engineers are working in London. So, what I see is that everyone who went somewhere else from here are working at the top positions at very high quality organizations. So, yes, I can’t accept that we do not have high standards. Fintech: Tell us about software outside of banking. MSI: After working for the banking sector we worked on microfinance management. Many in Bangladesh have worked in microfinance management. Our microfinance management project ‘Ektee Bari Ektee Khamar’ is being employed by three banks. Needless to say, every financial software must have a bank employing it, as we are not a financial institution. The scope of this software is very vast. Every union has nine co-operatives. Each of these cooperative has 60 members every member deposits a certain amount and then the government matches that amount and add to the equal amount of money to the original deposit. Other than that the government also provides a separate fund to the co-operatives. That’s what the software manages. Fintech: Could you go over how and what type and volume of data the software manages in more detail? MSI: Sure there are 40,000 co-operatives in the country. Every cooperative has 60 members, out of that 40 women and 20 men. They deposit Tk200 every month. These are really economically marginal people. I have been to many of their meetings, they call it ‘uthan boithak’. They sit in the yard (uthan) for their meetings. So, after the Tk200 deposit they make the government give them Tk600 to each member every three month. The project duration is two years. So, in two years they make Tk4800 deposit. And the government doubles that, giving Tk48 hundred more. So, each member ends up getting Tk.9600. As they deposit this in the bank the money grows to, say Tk10 thousand. So, the total amount deposited by the 60 members becomes Tk6 lakh. Apart from that, the government gives a separate fund of Tk.3 lakh to the co-operative. So, the total amount becomes Tk.9 lakh. It becomes approximately Tk10 lakh as they continue to deposit. Now think about if you or anyone would lend Tk.5 thousand to a barber working in the village? Truly, no one would. If someone does that he is probably a loan shark. But this cooperative is from the village and the manager is from among them. Only they, these 60 people, have the control over the Tk.10 lakh. Only they can decide how they use that money. We have automated the whole process in our software. The project is quite revolutionary. The project had started even before we build them the software. Before the automation the managers used to go to Sonali Bank branches to deposit the money. After the automation and software came into effect, when these incidents came into light, it was possible to take action against them. Some of the funds were recovered and in cases where it wasn’t possible to recover, the people who stole the money went to jail. As for the scale, there are 40 thousand co-operatives. There are 85 thousand villages. So, there are about one of these co-operatives in every two villages on average. If even 20 out of 60 from each co-operative could benefit from the project, then there are 8 lakh people in Bangladesh whose economic condition improved through this. In one of those ‘uthan boithak’ where I was present, a woman applied for Tk10 thousand loan. So, she was asked by the committee what she will do. Everyone sits on the ‘hogla’ mat in these meetings by the way. Anyway, she told them that her husband is a barber and they needed to buy a mirror and a chair. So, let me take you through the process now. There are field supervisors of the project appointed by the government. The field supervisor records that in writing and later submits a copy of that to the computer operator in the upazazilla office. Then the computer operator, who has a user ID for our software, inputs the data. The UNO (upazilla nirbahi officer) has access and logs into the software every day. He looks at the software and checks the applications. He then approves the application form the computer. After he approved the application the applicant gets an automatic message notifying him or her about the approval. Just think about that for a minute. Maybe that person is cutting someone’s hair or plowing land when he gets the message in his mobile phone. Fintech: That is quite extraordinary. MSI: Indeed, it is. Nowadays everyone has a mobile phone. But there is option for them to provide a mobile number that belongs to a close relative. Basically, the applicant is unaware of all of these steps. All he knows is that he applied and then he got the loan. The UNO doesn’t know the applicant, the computer operator also doesn’t know the applicant, but the loan gets sanctioned. After that the applicant comes to the upazilla office with his mobile phone for collecting the money from the UCO/ Bank Agent or Union Digital Centre. Fintech: Are these messages in Bengali? MSI: Yes. I wanted to use English. They are capable of using mobile phones, which have English keys. I think they should also get the message in English. And through that they could get educated too. Anyway, so after he comes to the upazilla office, he shows his mobile message with a receipt code. The attending officer then inputs the code into the system which generates another PIN code that gets sent immediately to the mobile. And that means the applicant is cleared to receive the loan. Money gets transferred to accounts through the automated process. So, here’s the figures, there are 40,216 cooperatives in Bangladesh. The total number of member is 22 lakh. The total amount deposited so far is Tk1,558 crore, government also donated in the fund against the deposit. And then there is government’s donation to the co-operatives. So, the amount of total capital is Tk3,365 crore, with interest. This capital is not at the hands of wealthy people. Who are using this money? It is being used by fishermen, cobblers, boutique entrepreneurs, and people like that. Let’s look at the number of loans being sanctioned. There have been 31 lakh loans so far, which have been disbursed amounting to four thousand crore taka. The software gives access to all the information, including all the steps of transactions. The database also has profiles and details of all the members. And this is of course, one hundred percent online. Fintech: Tell us about the other work you have done and how your agent banking solution came about. MSI: Other than the EBEK project we also worked, what can be called, in the field of financial inclusion. This entails including the unbanked people in financial services. Our banks can only serve 40 to 45 percent of the country’s population. The rest are unbanked. Unless you bring them under financial services, you can’t calculate GDP growth properly, neither can they achieve economic emancipation. That is the kind of philosophical backdrop to our agent banking solution. Bank Asia has an enormous contribution to help this come to fruition. It has given us tremendous support. It has implemented the solution. Bank Asia provided all kinds of support including consultancy. Agent banking is of course a solution which enables you to bring the unbanked people from remote/rural areas under financial service. We have implemented the solution by penetrating remote areas using web, mobile apps, biometric, NFC (near field communication) enabled secured transaction, and work is in progress to implement machine learning enabled artificial intelligence. In other words, we have used all the cutting edge technology in implementing the agent banking. We made fingerprint mandatory, because cheques tend to get exploited. Also it is much easier for the ordinary rural people to use fingerprint instead of handwritten signature. The fingerprints are saved and kept in central server and they get verified when someone withdraws money. Very soon we are going to introduce the face recognition system for the first time in Bangladesh for financial transaction. Customers also get NFC enabled ID cards from the banks. When an agent is going to give money to a customer – maybe the customer is physically impaired let’s say – he takes tab with him, which can read NFC. The customer has his card and when the agent touch the card on the device the customer’s whole profile comes up. It shows his applications and every other relevant data. So, the agent gives him the cash and the account is debited accordingly. So, we have incorporated these technologies. Bank Asia is using this technology to disburse the payments against the government’s social safety net. Bank Asia is already providing this service collaborating with A2i & Ministries to 12 thousand people, through what we call NFC enabled social safety net payment system. Also through the agent banking providing deposit mobilization, different types of deposits, withdrawing, opening DPS, FDR, loan originating and approval system, loan mobilization is another product though. Through our software end users are paying the ‘palli bidyut’ bills from remotest of areas. But this isn’t limited to the palli bidyut bill at all. They can pay the remittance, passport fees, which you couldn’t pay before without going to Sonali Bank. So, the agent banking is reaching areas where there are no easy communication routes. We also created school banking solution. We have enabled the software that is used to open accounts for school children. So, through this their fees get deposited and if a student gets stipend from the government that is also deposited to the student’s account automatically. This is also helping students get introduced to banking, which was unthinkable at our time or more recently even. Agents are teaching children how to deposit money etc. We have ensured doorstep service. If someone has a Smartphone or a tab or a laptop then he can become an agent, and then he can simply connect with a modem and provide the agent’s service. You don’t have to depend on telcos, you know their history. Fintech: Interesting, so, this is fully carrier independent? MSI: This was our challenge. ERA took up this challenge and faced a lot of criticism as well for this. Many banks have reproached us for not doing the USSDBS with a telco. Particularly it was my commitment. So, we resisted this because if you go through telco. then poor people can’t afford it. Now Bank Asia has about 2 lakh accounts in this system. If each account has one transaction then there are 2 lakh transaction, then it is a huge amount per day. People pay lip service to the country not in action. Mahatma Gandhi spun yarn to make his cloths and taught everyone to do the same. But now people give long speeches and then purchase foreign products saying local products aren’t good enough. If the local products are not good that’s because they don’t have the money to run R&D. If you don’t give them that chance… you have to give people chance. Fintech: And Kenya gets cited the most as a success story. MSI: Exactly. Here though, people are in awe of anything foreign. Delegates from At least 10 countries visited BA Agent Banking to see our agent banking. And all of them were astonished seeing how many services are being offered. They don’t have that many services in Kenya. I think this will be eventually more recognized and appreciated. Inshallah, we are going to enter in an international competition with our agent banking solution and microfinance solution. Hopefully, the learned people of the ICT sector in the country will take notice then. Maybe many of them would be agitated at this. But our intention is not to agitate anyone. Our ‘EBEK’ got the first place and was given the Manthan Award in South Asia and Asia Pacific for ICT &. Digital Inclusion. 35 countries participated there. Fintech: You have touched on this but could you go into more detail about the impact of your microfinance solution and agent banking solution on the local economy? MSI: The cost effective solutions are helping the local community to progress. This is empowering through financial development. That is the impact I think. But look at the financial education also. People are being educated. Overall these are going to have an impact on national GDP. Fintech: On that note, please describe how your products or services address the Sustainable Development Goals (SDGs)? MSI: Agent Banking Solution is used by the banks to provide banking services to unbanked people in the remote areas of the country. Age worthy technology including Artificial Intelligence, BOT, Mobile apps, Bio Metric, OTP, Webcam, NFC authentication has been used to develop the solution that follows CMMI, ISO & ISMS standard procedures. Through Agent Banking A/c opening deposit mobilization, loan originating & mobilization, utility bills collection, local & foreign remittance, fund transfer, EFT, RTGS, school banking with financial education, social safety net payment services are ensured at the doorsteps of the remote people. Agent Banking Solution – is cost effective solution and it is impacting local community by empowering financial development, financial education and overall national GDP through socio economic development. Fintech: In terms of number, how many unbanked people have you reached? MSI: Our agent banking solution has reached nearly 2 lakh unbanked people. But this is just the start. There will be exponential growth once you reach a certain point. You will be glad to hear that right now over one thousand accounts are being opened every day. This is going to be a gold mine for the banks in the future. Fintech: Who are mainly delivering these? MSI: Mainly Bank Asia and we are in the talks with a few other banks. The matter is that this does not bring in big profit. The big entrepreneurs think about the profit first. That is why there has been a lack of interest in a way. There will be a time when there will be interest, there is no doubt. And it will ultimately help people. Fintech: But even from a profitability aspect, there is big profit potential in it, as is probably well established by now. MSI: In due course of time it is going to be huge. Today in a conventional banking you have exposure to say four thousand crore taka and it takes 35 years for that money to come in. But if you work in agent banking for 20 years you the exposure will be same. So, there is big future here. The government is also thinking about how to best utilize this. We want to provide the technology for that. Fintech: What is the staying rate of employees like at ERA? And is that typical of your industry? Also please talk about what kinds of in house training you have. MSI: Our retention rate is very high, much higher than other local software companies. Some leave of course, like I mentioned before, some went to USA,UK, some to Australia, some to Dubai, but normally our engineers leaving to join another local software company has to be less than one percent. They understand that we value them. Fintech: As the CEO you have to look after a lot of things. What is your personal approach to leadership? MSI: I believe in participatory management, because I believe that is the best management. If you look out the door of this room you will see, hopefully, there is minimal intervention. But people know when to do what. I have to coordinate with the board, that is an essential part of what I do. I have to give them the annual budget and overall you have to satisfy them. And in marketing I try cater to the needs of our clients. I tend to visit clients personally all the time, I find that it helps maintain a healthy relationship. What I give most importance to is human resources. I really do put a lot of importance on human resources. I am not a very vocal person. But I try to transmit what I believe in to my coworkers. I try to give them the feeling that it is their own organization. I strive to create self-responsibility. I think this is one of the major areas that I always work on. I actually did an Advanced Management Program under the University of Hong Kong. It helps me a lot to address weakness of leadership. Basically I have learnt a lot from this executive education program. Three things are important for a leadership. The first is full understanding of what you want to say or to do. The next important thing is you have to have the mentality to take responsibility. The last is risk taking mentality. When I take a decision I do it with the understanding that there are risks involved. If you fear that or worry about that too much then you can’t progress. I believe in this three things and I think a management person has to have these qualities. We had a senior auditor from CMMI Institute audited us. He was actually the first Indian person to become a CMMI senior auditor. He interviewed literally everyone in the office and only I was left. Later on he informed me that when he had asked people why they were staying at this organization they gave two reasons: one was that they liked the environment, and the other was that they liked the CEO. But I don’t care so much about whether or not they like me as a person. But they have to like me as a leader. Fintech: Thanks very much for taking the time to talk to us.